In a sandwiched seam, three layers of fabric are stitched together to make the seam. This seam is often used to stitch a yoke in a shirt, skirt, or blouse. It is a popular style line, especially in men’s shirts. However, this does not exclude itsuse for women’s wear. Observe the back yoke of the striped shirt in Figure 6.28a. Refer to Figure 6.28b to see how the two yoke pieces are placed on either side of the back shirt section, sandwiching them together. After the yoke seam is stitched, it is pressed and topstitched with an edgestitch, welt, or double topstitch (Figure 6.28~). 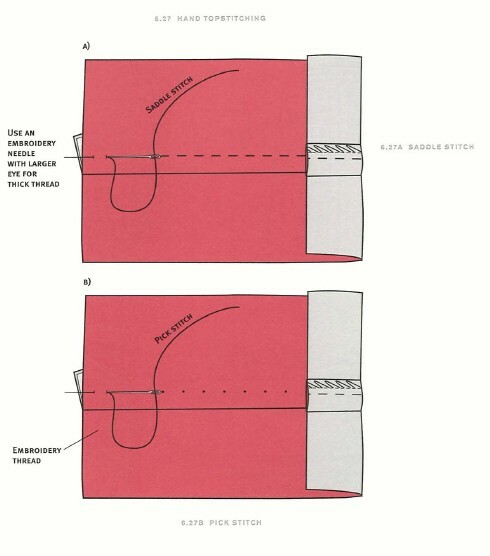 Next, the front shoulder seams are stitched, as illustrated in Figure 6.28d. Do notice that the front bands and pocket were stitched to the fronts before the yoke was applied.